Have the best luck in the Year of the Fire Monkey by wearing the good luck color of the year. February 06th 2016 - On February 8, 2016 the exciting and vibrant year of the Fire Money begins. The Monkey is known as the Trickster in the Chinese zodiac. Beware of his ability to seduce you into his “monkey business”. If you’re gullible, his antics can prove to be quite costly for you financially and emotionally. To keep from falling prey to his “monkeyshines” and reap the benefits of the year, surround yourself with the element of the New Year which is Fire. The Feng Shui element of Fire is not for the timid. Fire is passion to the max. As the Bible says, do not keep your light hidden under a bushel. Let it shine! Fire is vibrant, life giving, warming, visionary, and intense. So light your fire by displaying more flamboyance and panache in dress and home décor. It is not the year to be shy with your creativity in these areas. The color which signifies Fire in Feng Shui is red. So red and all its hues from the palest pink to the deepest scarlet will be extremely auspicious colors to surround yourself with during the next twelve months. Red is the most yang of all the colors. As a result, it is the most powerful conductor of chi. The Chinese have always considered it the good luck color. It emits an energy of happiness, courage, warmth, and fame. Due to it being such a powerful energy source, it is used in cures to bless as well as banish bad chi. Master Lin Yun, whom I studied under, compared it to the source of all energy of the universe. Due to its high intensity, it is best to use the pure forms of the color red. Muddy shades like brick red imbues accomplishment, but only after excessive hard work. Pink will also attract much good fortune in the Fire Monkey year. The color represents love but lacks a sense of aggression. Salmon pink is the universal color of love. Rose pink denotes unselfish and constant devotion. If you want to attract a loving relationship this year, wear pink. Also try including some pink touches into your décor like flowers or pillows. Purple is also considered a Fire color and will reap much luck for wearer in 2016. The deep red or plum shades are considered by the Chinese in some respects to be even more auspicious than red. It was the color originally reserved to be worn only by the nobility in Europe. In Feng Shui it draws in power, good fortune, and heightened spirituality. Animal prints, furs- real or fake, leather, bone, and feathers are all Fire too. Wearing or decorating with them will attract good luck. Since the fire element reigns this year, try to keep wearing his foe Water to a minimum. Water extinguishes Fire. While we need all five elements for balance, wearing too much black, dark blues or navy excessively during the year, can be counterproductive for positive advancement. If you are required by work or social situation to wear black or water colors, do not wear red as a secondary color alone with it. This will drain your energy and create strife. Remember, black (Water) puts out Fire. Add something green, wood jewelry, or a floral print to the black and red mix. The Water color then will grow the Wood energy, which creates Fire energy. 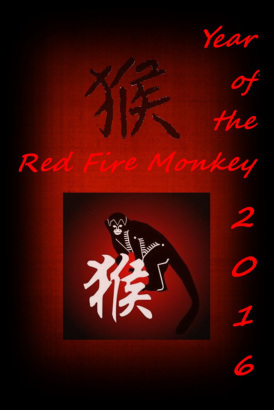 Balance is achieved and you’ll be in harmony to receive the blessings of the Fire Monkey Year. While she began formal training and became a disciple of the world-renowned Feng Shui Master Lin Yun, Grand Master and spiritual leader of the Black Sect Tantric Buddhist School of Feng Shui, many years ago, her studies on Feng Shui extend longer into the past. Judith has traveled to over 45 countries investigating and researching sacred sites and their corresponding ley or dragon lines. On her many trips to Central and South America, she has studied directly with native shamans to learn their cleansing and blessing rituals. She has also received certification from the Qi-Mac International Feng Shui and Geobiology Institute. The first hand experiences she has gained through decades of travel and study have made Judith one of the most sought after advisors in the United States and Western Europe. Judith’s Feng Shui practice specializes in home, office, and business environments. Many multi-million dollar corporations, risk management firms, doctor’s offices, hospitals, restaurants, law firms, and retailers have commissioned her. Judith is a charismatic public speaker and seminar leader and lectures in the United States and abroad. Her lecture expertise has been engaged by the top world cruise lines to enlighten and entertain their passengers. She is a popular guest on radio and television stations. She taught at Middlesex College in Edison, NJ courses on Feng Shui and the Tao of Color from 1993 to 2004. Judith wrote an Astrology column for NJ Holistic Magazine from 1993 to 2003. To schedule an appoitment or for additional info, please contact Judith at FengShuibyJudithRyan.com or phone 201-858-1689.